Colourful Creatures is a twelve-piece series of extraordinary coins by the Austrian Mint. Just like certain nocturnal species, the animals featured on the coins become active at night by glowing in the dark. Guaranteed to delight animal lovers of all ages, the series obviously has special appeal for children, who can enjoy them even after they have gone to bed. 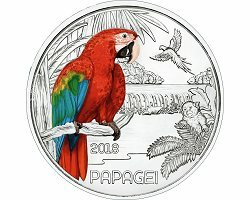 But we believe our Colourful Creatures series is going to prove just as popular as our innovative Silver Niobium coins, which are such a huge hit with collectors that most issues have completely sold out. The Austrian Mint’s master engravers have taken their world-famous craftsmanship and attention to detail to another level with this series by combining the coins’ surface relief, colour application and superb artwork to dramatic effect. Even the coins’ face value is out of the ordinary. Colourful Creatures is the first ever Austrian 3 Euro coin series. It features twelve glow-in-the-dark coloured coins, which will be issued every three months over the next three years. With a maximum mintage of 50,000 pieces, the coins come in special ten-coin packs for dealers.